Gotta say - I love all of those 3e power armor builds. Always liked those in fiction, those and mechs. Any chance of a Guyver build or better yet a Guyver-like playable build? Stay tuned and let's see what the 'flame is cooking. The Guyver is indeed powerful as all hell. Between the speed, strength, gravity control, Megasmasher and sonic cannons he is a walking, talking powerhouse. I think a playable version would have to skip the gravity control and go with armor, megasmasher and maybe claws/sonic cannons. I think a Guyver-lite build at 150p is possible albeit in a very limited fashion. I would do one if note for my total newbie status to the game. To conclude - I love the Guyver. Probably my favourite 'power armor' character EVER. Despite his power his battles were always a contest and the story is incredibly well done. Also - LOVE the design on the armor. Here is a add-on for a normal person. It comes to a grant total of 99 pts. It is rather costly, but it can turn an average schmoe into a combat monster. This is a Alien, Biologically-based Bio-Boosting armor system that bonds to it's wearer. Yeah.... GUYVER!!!! First of all - BIG BIG BIG THANKS! This is awesome! I will probably scale it back a little bit as I need some points to buy the guy that is in the armor first - but it's total what I wanted. Thanks again. This is going to be my first character in our group - a powerful bio-mech user. Just to clarify how would this work in game mechanic terms? This is just a set of powers to add to a normal person? So I build a normal person with 51 points and add this onto them correct? Zdan wrote: First of all - BIG BIG BIG THANKS! This is awesome! I will probably scale it back a little bit as I need some points to buy the guy that is in the armor first - but it's total what I wanted. Thanks again. This is going to be my first character in our group - a powerful bio-mech user. This is merely the powers that can be added to an ordinary schmoe. Remember that in 3E the "average" human attribute is around -0-. If you were to create a normal guy, you could build them with the 51 pts and then add in the Bio-booster armor powers. WARNING!!! I have not calculated in the Power Level caps. Once you add the armor, you will need to review the final stats to make sure that they comply. This is cool because it makes a mighty fighter out of a teenager which I planned the guy to be. Awesomesauce. Thanks again for this. Also how would the defenses look for this guy with the Bio-booster armor powers on? I assume this is what you mean by Power Level caps as I don't see like PL caps affect attack rolls and such. Most of its defenses are based off of its enhanced attributes. Really I think you have to build the hero... Slap on the armor and see what you have. You might need to tweak a little but then again... When don't We?? Emerald Flame wrote: Most of its defenses are based off of its enhanced attributes. Really I think you have to build the hero... Slap on the armor and see what you have. You might need to tweak a little but then again... When don't We?? Okay. I might come back to this thread in a day or two (busy now) and post what I found. Secret: Secret wearer of an alien bio-booster armor system. Here is a build for a 3E Bio-Booster Guyver unit. I had to trim down my original build in several areas as it blew the PL limits pretty quickly. I thanked you via PM Emerald Flame but a public thanks is also in order. BIG THANKS! I knew the Tank was a friendly board but I did not expect this kind of friendliness. I am actually amazed you took the time just to help me with my character. Really - big thanks from me and all of my gaming group as probably reverse engineering this char is how we will get char creation. I probably will shift some stuff around to make the char a better hitter and having him a decent parry and will but otherwise - excellent job. I love the addition of flight - it makes him even more mobile. You forgot one important effect for Rex which is his healing/repair effect on affected people. technoshaman wrote: You forgot one important effect for Rex which is his healing/repair effect on affected people. I gave him "Nanite Control" which I figured would cover the "healing" ability. He seems to take control of the malignant nanites and shuts them down... Or at least gets them under control. for prototyping and developing new technologies. with machines and also granted him an accelerated mental capacity. Weakness: If the PALADIN suit is destoryed or disabled, the S.Q.U.I.R.e deactivates. The biggest change I made was to change the outside appearance. In character, Paladin started doing the "hero thing". He quickly realized that the suit, even though effective was too bulky. He worked well on the streets but his bulk became a problem in smaller environments. He made the choice to par down the size of the suit, foregoing the style of the original suit and working with a smaller, more stream-lined design. The suit's weapons systems were also changed. Due to the smaller suit design, the weapons had to be modified to account for reduced space for ammunition. Another issue that showed up was the sheer damage that some of the weapons could inflict. The Multi-Strike Missle System was capable of raining submunitions in a large area. This works well on the battle-field, but when trying to fight in a crowded location. * Multi-target Anti-Personnel Weapon which is capable of targeting up to five (5) independent targets. * Focused Particle Beam Saber which is a sword created from a focused particle beam contained in a magnetic bottle. * Harpoon and winch. The Harpoon launcher can fire an armor piercing harpoon that is attached to a super-high tensile synthetic alloy cable which is in turn secured to a high-torque power winch which is capable of pulling with 1600 lbs. * Poly- Steel Binders which are fired as small capsules which open and expand to ensnare the target. The tendrils wrap around and bind the target. The final advancement made to the suit was the addition of an advanced visual interface. The visual sensors that are built into the helmet allow for an advanced 360 degree compressed field of view. The sensors create a 360 degree image of the suit's environment and then compresses it into a normal field of vision.. This creates the ability for the Paladin to have a sort of "danger sense" due to the fact that it can effectively see all around itself. This gives the Paladin an advantage over other battle suits. The visual interface was made possible due to the advanced neuro-interface that Carter has because of his nanite-rebuilt nervous system. The suit is also equipped with a S.Q.U.I.R.e (Super Quiet Untethered Information Retriever) A remote controlled vectored-thrust camera platform that can give the PALADIN a bird's eye view of the battlefield. It is small and when not in use, the unit is housed inside the armored back-shell of the suit. It can be deployed rapidly and released to maneuver around and become Paladin's eyes and ears at range. The S.Q.U.I.R.e is approx 6 inches across so it is easily able to maneuver through buildings or other small environments. Last edited by Emerald Flame on Thu Feb 17, 2011 10:07 am, edited 1 time in total. think-tank for prototyping and developing new technologies. nanites that bonded to his nervous system and rebuilt it. machines and also granted him an accelerated mental capacity. The Paladin 2.1 R.D.S. is a compact and a little weaker version of the full-sized Paladin Battle Suit. The R.D.S. or Rapid Deployment Suit was designed by Carter Hargrieves as an emergency unti that was portable and able to to be donned rapidly. The suit uses some of the same systems as the full-sized suit, but lacks a lot of the weapons and extras that the full-sized suit employs. The suit is stored in a "collapsed" configuration in a backpack that can be worn by the operator. 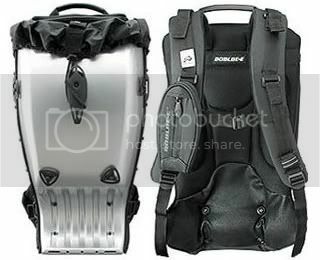 The backpack is secured to the operator by two shoulder straps and a wait strap. When activated, the suit proceeds to unfold and open up. The suit rapidly surrounds the operator with a powered exo-skeleton. There is light armor but the bulk of the preotection comes from compact kinetic shield generators. The armored look of the suit is more cosmetic than functional. This was done because of the weight restrictions of carrying the suit around. On-board sensors allow the suit to rapidly transform into the armor-mode without injuring the operator. The R.D.S. is incapable of flight and is armed only with a kinetic pulse weapon. The initial concept was to be able to provide Carter with a suit that could be readily carried around and kept close-by so that he would have the ability to protect and defend himself and also so that he would not give away his identity if not needed.